From the first time I visited the Tree House Child Care Center five years ago, I knew that the Tree House was the place where I wanted my children to attend preschool. I was looking for a preschool that would allow my children to socialize with other children, be with loving and caring teachers and learn through play. The Tree House has met all these hopes and more. 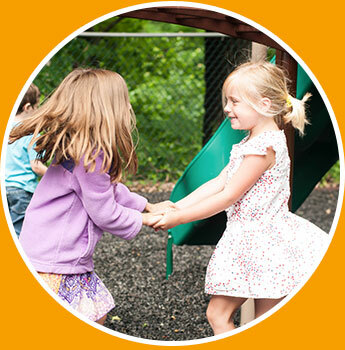 At the Tree House we believe strongly that children learn best through play-based experiences. By implementing the “the Creative Curriculum” in 2014, we have provided our teachers with basic guidelines to ensure they are meeting the social/emotional, cognitive and developmental needs of all of their students. The most important goals of the Creative Curriculum are for the children to get along well with others and become enthusiastic learners. We want children to become independent, self-confident, curious learners who can work well with others. We’re teaching them HOW to learn, not just in preschool but also throughout their lives. We do this by creating purposeful and productive play experiences that help children grow in all areas. If your child is having fun, playing and becoming curious about the world around them, then the Tree House teachers are doing their jobs. Children who attend the Tree House participate in a Music and Creative Movement class directed by a professional music instructor once a week. The class includes singing, dancing and instruction with basic instruments such as rhythm sticks, drums, shakers, etc. Polar Express Day: a day when both the children and teachers wear comfy clothes to school and experience first-hand the magic of “The Polar Express™”. Overnight, the school is transformed into a winter wonderland with train tracks, tunnels and a north pole. Art Week: This is a special week at The Tree House where each class picks an artist whom they study throughout the week. They learn about the artist’s preferred style of expression and then, as a culminating activity, they create their own masterpiece using that artist’s techniques. At the end of the week,  The Tree House is turned into an art museum and children walk through the halls learning about the  different artists. At the conclusion of the tour, they enjoy snack at the Art Café which is run by our 4 Plus class.